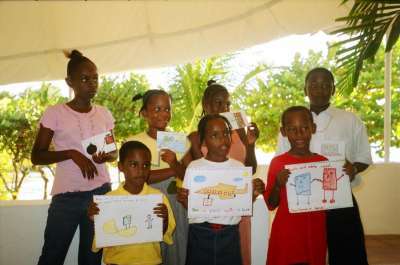 Island Books sponsored a poster and postcard contest to help promote the project. Students from all primary schools entered. All entries showed creativity and artistic talent. The winners were announced in March. Prizes were awarded in both categories. Posters from K-3 and postcards from Grade 3-6. The first prize winners in each category received $50.00 gift certificates from The Tackle Box.The Tackle Box generously matched these gifts which were given to the winner's school. First prize winners also received a book "The People Could Fly" by Virginia Hamilton. Other finalists received ice cream coupons from Ashley and Sons. Ashley and Sons generously donated ice cream cones for the honorable mentions. The winning choices will be printed and used to promote the project.